Patrick Godana is Sonke’s Eastern Cape Provincial Manager. Prior to taking on this role he was Government and Media Liaison. Throughout the 1980s and 1990s, Patrick was an anti-apartheid activist in the Eastern Cape township of New Brighton. A member of Umkhonto We Sizwe, the ANC’s armed wing, he spent many years in exile and was subsequently incarcerated as a political prisoner. With the arrival of the new democratic dispensation, Patrick earned a degree in theology from the University of the Western Cape and shortly thereafter took a position at the Planned Parenthood Association of South Africa (PPSA) where he was influential in shaping the design of the Men as Partners (MAP) Programme. After leaving PPASA, Patrick coordinated a workplace HIV/AIDS programme for Ford Motor Company in Port Elizabeth. 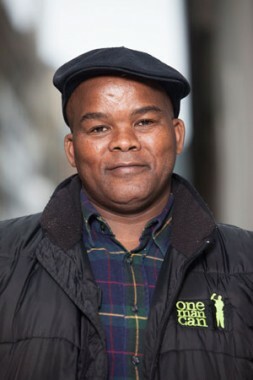 He then joined EngenderHealth in 2005 and provided training and technical assistance to a range of organisations in the Western and Eastern Cape including the Treatment Action Campaign (TAC), the Steve Biko Foundation and Masimanyane Women’s Support Centre. During this period Patrick represented the Men As Partners Network internationally, traveling to Sweden and Mozambique, amongst other places. He has been at Sonke since 2008 and has held a number of positions, including coordinating the implementation of work with children affected by HIV and AIDS in the Eastern Cape, implementing the MenCare Campaign in South Africa, Namibia and Botswana and coordinating Sonke’s community mobilisation work in rural parts of the Eastern Cape. Patrick is an ordained Lutheran priest and ministers to a multi-racial, social justice focused congregation in Cape Town. He and his wife Thoko have two children and live in Cape Town.